As Volkswagen takes dramatic steps to make its lineup more attractive to Americans, it is making its lineup simply less attractive. The new Jetta and Passat are both bigger and cheaper than the cars they replace, but they're also rather boring looking. 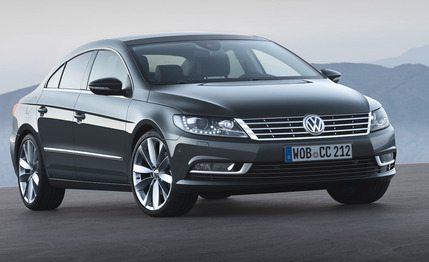 Boring is a word nobody would use to describe the Volkswagen CC, until maybe now. VW will be showing off an updated CC at the L.A. auto show later this month, and the good news is that the sultry sedan gets a bit more standard content. The bad news is it now wears VW's new corporate grille. The old CC's plunging, double-height grille is gone, replaced by a piece that looks as if it were plucked right off of the 2012 Passat. Likewise, the head- and taillights have been reshaped from the sculpted fare on last year's model into larger, simpler units. That this would happen was obvious when we spied a camouflaged CC out testing this past summer. It's not ugly, and the net effect is not as bad as we'd feared, but the new, simpler shapes up front rob the car of some of its glamour. If the lights are toned down, at least their illumination power has been cranked up: adaptive bi-xenon headlights and LED taillights are now standard. Any volkswagen guys out there?